We were at the intersection of ALL THE GOOD THINGS this past weekend. 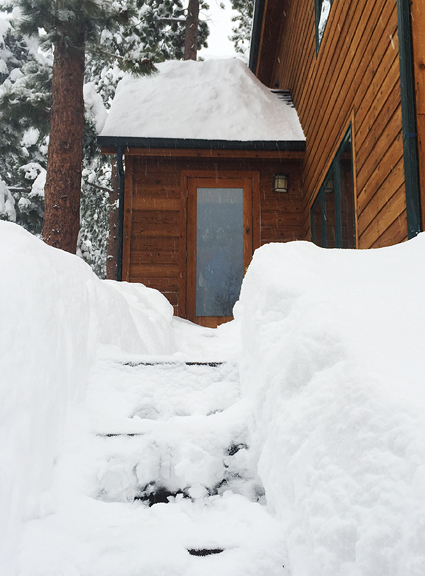 It snowed 2 feet at our house which meant: 1) BIG DUMP SNOW DAY! and 2) hours of shoveling dense spring snow. Jeremy says it combats what our friend calls “professor arms”. 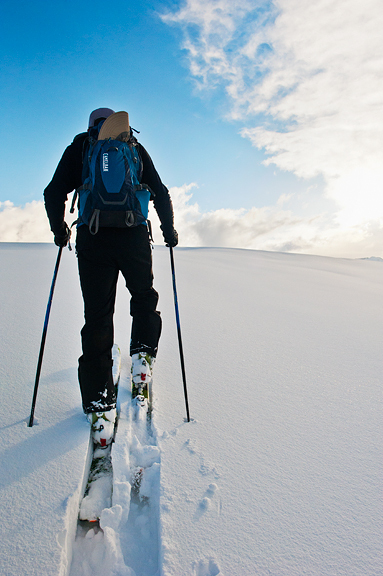 But the whole reason for shoveling is so you can get to work or… go backcountry skiing! It’s like a warm up before you exercise some more. Plus, it justifies a little indulgence later on. 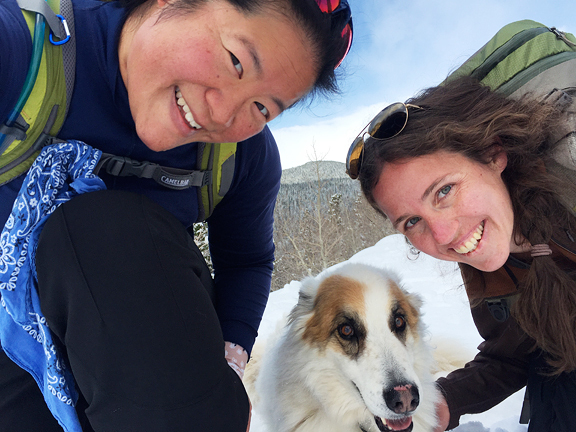 I logged my 100th day on skis this season over the weekend. Considering the paltry snowfall during our prime ski months, I’d say that’s not too shabby. It wasn’t my main goal to become a triple digit girl, just to keep active and fit through the winter. And to get outside often. It has been good for my body and mind, but most of all it has been excellent for my soul. What I loved about our weekend storm was how it stayed cool and lightly stormy for several days after the 2 feet fell. 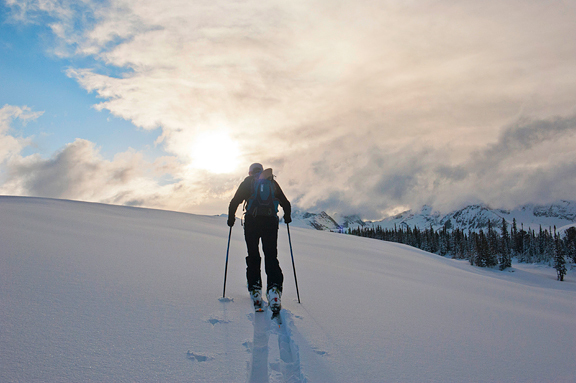 That helps to solidify the snowpack so it will stick around longer, ski longer, water the mountains longer. It also makes for cozy evenings with warm blankets and Kevin Spacey. 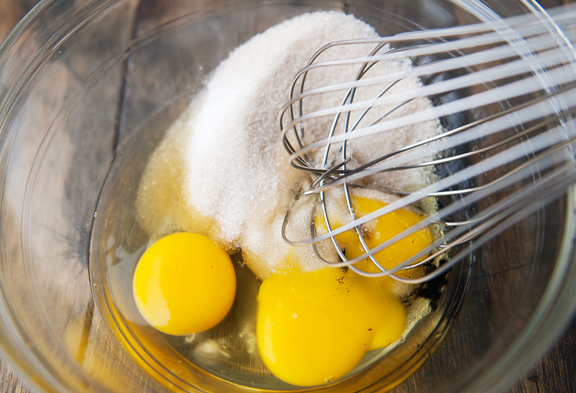 This weather is conducive for baking, too. While recently digging through old photo archives, I came across a series of wildflower photographs from Big Sur about four years ago. Flowers flowers flowers and then – a strawberry tart. Actually, it was a strawberry brown butter tart from the Big Sur Bakery and it was the most heavenly pastry I had tasted in a long time. 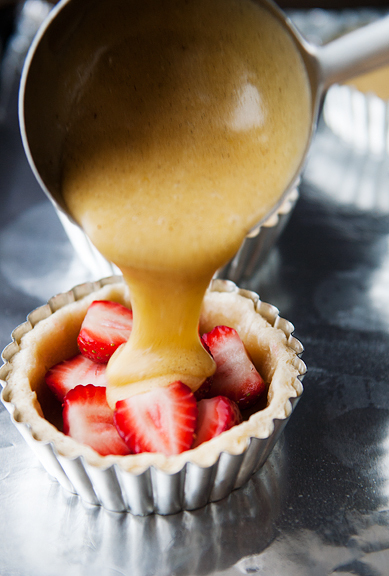 I think everyone needs a strawberry brown butter tart in their lives. This one starts with a flaky, buttery crust. 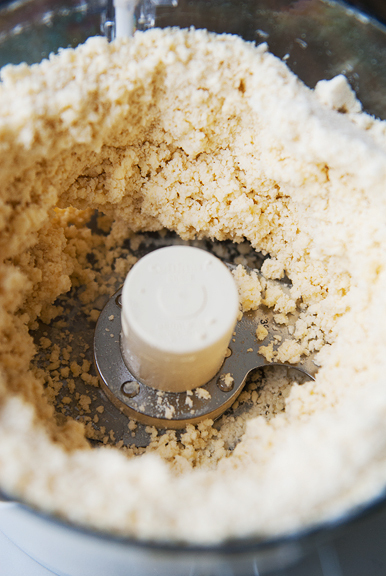 When you’ve made the dough, you should chill it for at least a half hour before rolling it out. I let mine sit in the refrigerator overnight and I imagine you could let it sit for a couple of days until you’re ready to bake the tarts. I used 4-inch diameter removable bottom tart pans with 2-inch sides. Actually, they are advertised as 2 inches high, but they’re closer to 1.5 inches. I don’t recommend going any smaller in diameter or shorter in height or else your pastry to filling ratio will be too high (I know this because I tried it). The original recipe uses the larger ball of dough for the bottom crusts and the smaller ball of dough for the decorative lattice. Since I didn’t want a lattice top crust, I cut my dough circles from both balls (four from the larger, two from the smaller) and used the scraps for cutting out cute little flowers. It just meant I didn’t have to re-roll the scraps. 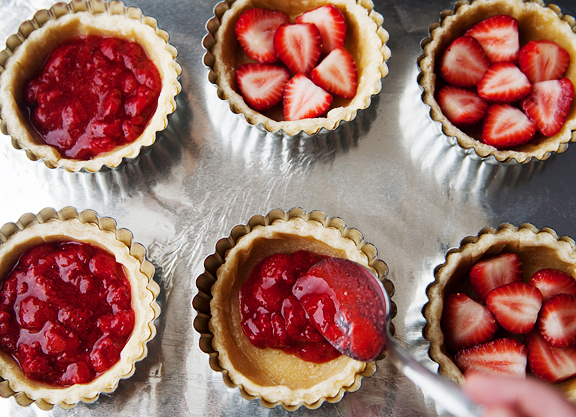 Do what works best for your final tart decorating vision. Some experimentation went into the filling. 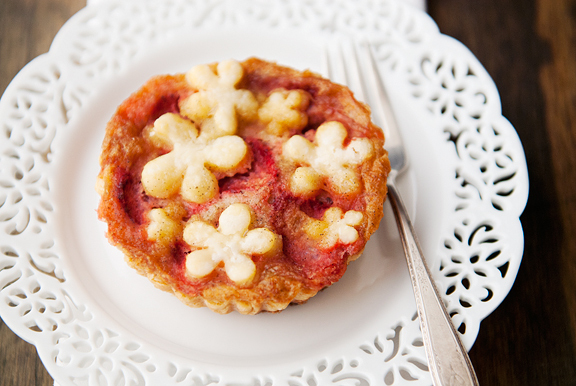 I wasn’t sure if I wanted fresh fruit in the tart or more of a jammy cooked strawberry filling. In a side-by-side taste comparison, Jeremy and I both agreed that that fresh fruit version was far superior. That said, you can always use jam (even store bought) if you can’t get ahold of fresh fruit and it will still be delightful – just not as amazing. The jam version is more like a bakewell tart. A word on browning the butter. 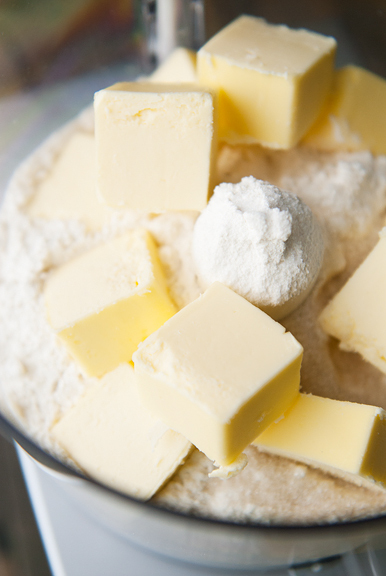 If you haven’t done it before (which, I hadn’t until now), I find it helps to stir the butter while the solids brown. 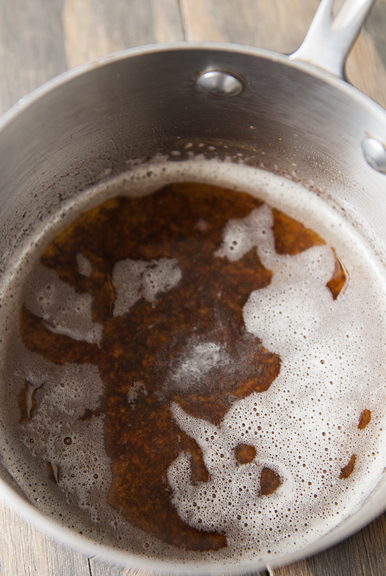 The first time I browned the butter and didn’t stir, it resulted in browned solids stuck to the bottom of my pan. On the second go around, I gently stirred the butter as the solids browned and not only did they not burn to the bottom of the pan, but I think the browned butter smelled better (more browned and less burnt). When you blind bake the pastry crust, there will be shrinkage. That’s okay. I found that I had less shrinkage with dough that had been rolled out once versus dough that had been re-rolled from scraps. 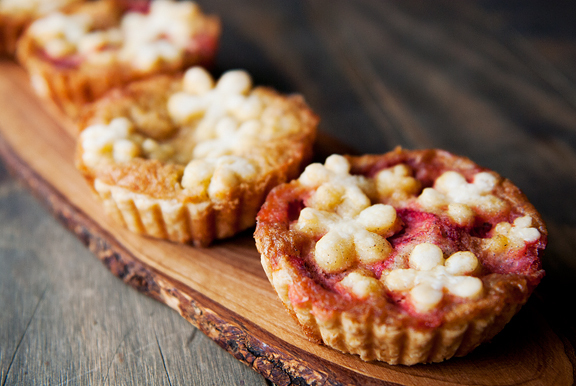 Fill the tarts with fruit to the top of the crust, then pour the batter over the fruit. 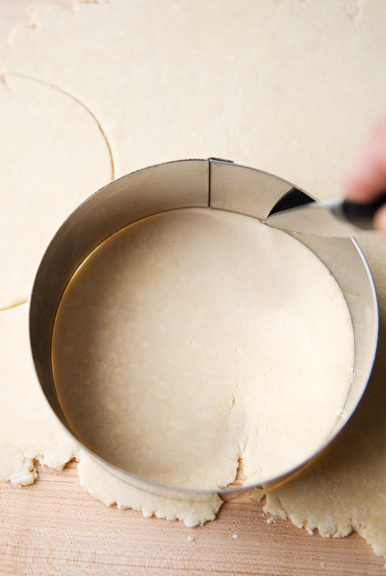 For aesthetics and ease of removal, only pour in enough batter to just cover the fruit or go to the edge of the crust. If you don’t care what the final tart looks like or if you don’t mind prying the stuck edges from every little fluted edge of the tin, then fill it to the top. Your choice. Overfilling the batter does two annoying things: 1) it sticks like crazy to the tart tin which can be problematic if it seeps down between the base crust and the tin’s sides and 2) it sometimes covers up the crust top, obliterating the pretty design. If you pour just enough batter to cover the fruit, then the colorful fruit juices will bubble up and contrast nicely with your crust top. 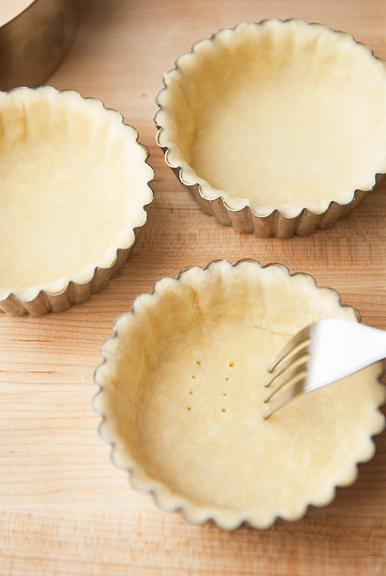 You’ll also have an easier time popping the tarts out from the bottom. 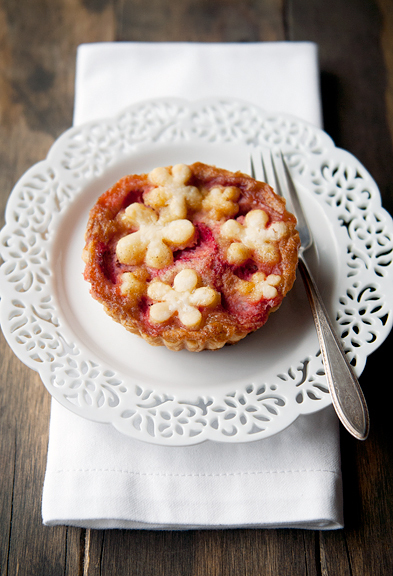 So were these strawberry brown butter tarts as good as the one I had in Big Sur? No. They were BETTER. The fresh fruit really makes it extra scrumptious, so this is the time to take advantage of fresh strawberries. The original recipe calls for blueberries and I think any berry or stone fruit (peach, plum, cherry) would work beautifully. And with Mother’s Day just around the corner, I think this would put a big smile on Mom’s face. 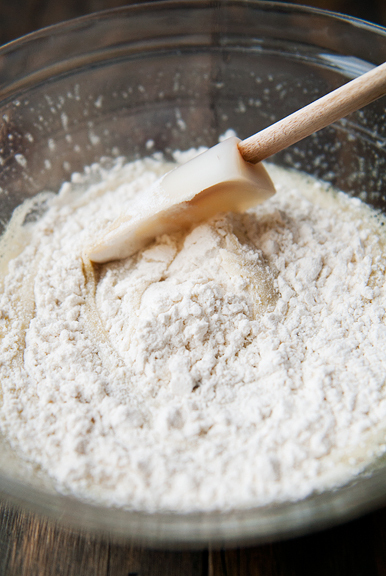 Prepare the dough: Place the flour, 1 teaspoon salt, 1 tablespoon of granulated sugar, and 1 cup of cold butter pieces in a food processor fitted with the metal blade. Pulse until the lumps in the mixture resemble small peas. 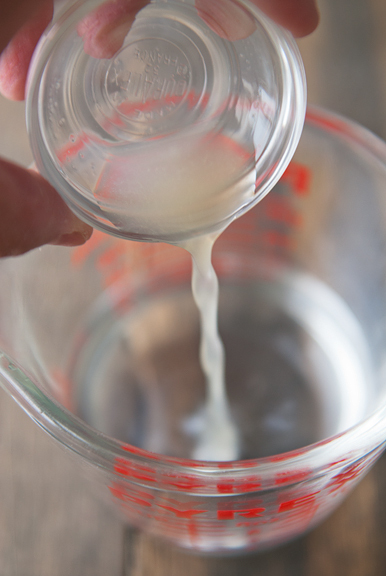 Combine the ice water and lemon juice in a vessel. 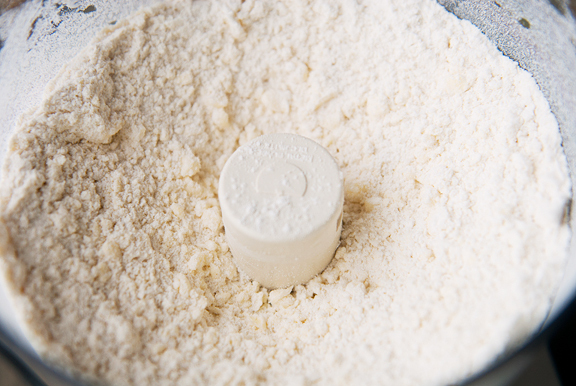 Pour a little ice water at a time into the flour mixture while pulsing the dough to incorporate the liquid. 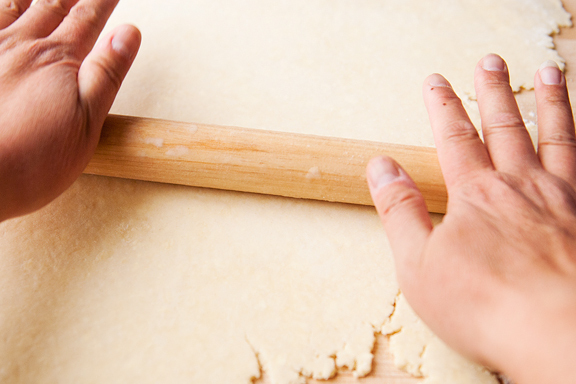 Stop when the dough just starts to come together. 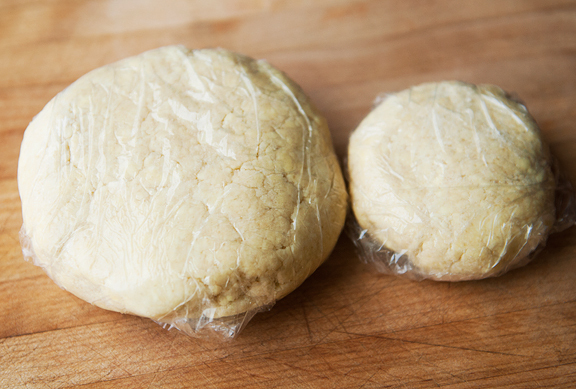 Divide the dough into 2/3 and 1/3 portions, wrap in plastic and chill in the refrigerator for at least 30 minutes. 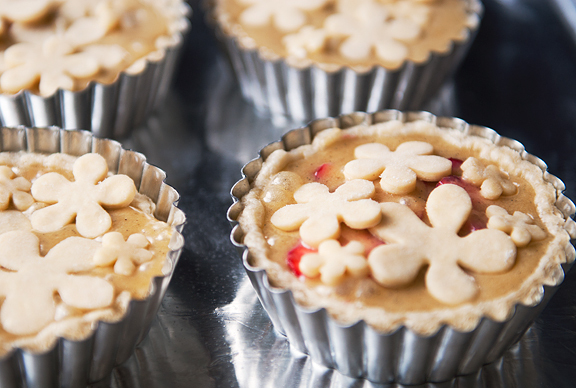 Make the tarts: Preheat oven to 350°F. 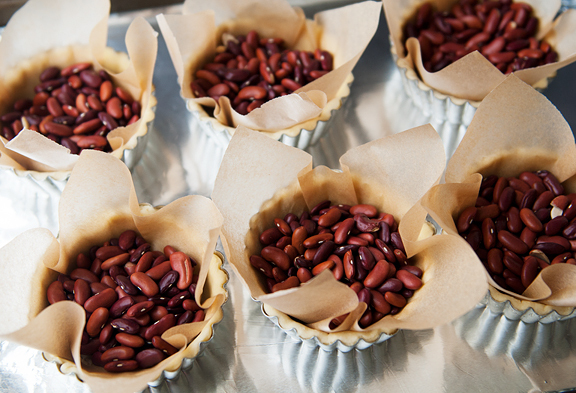 Line each tart dough with parchment paper and fill with pie weights (I used dried beans). Bake for 15 minutes. Remove from oven and let cool. 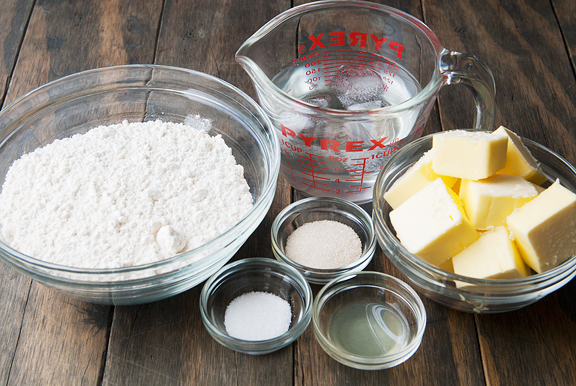 Remove the pie weights and parchment paper. Leave the oven on. 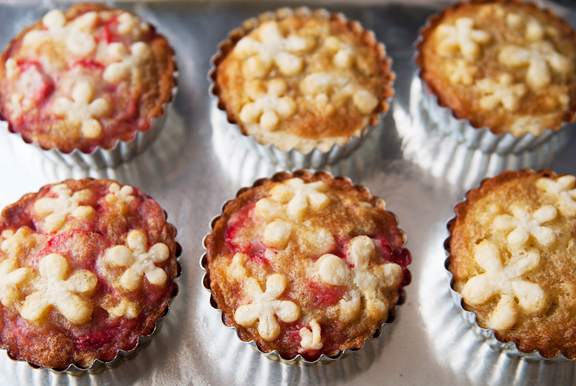 Divvy up the strawberries among the tarts. 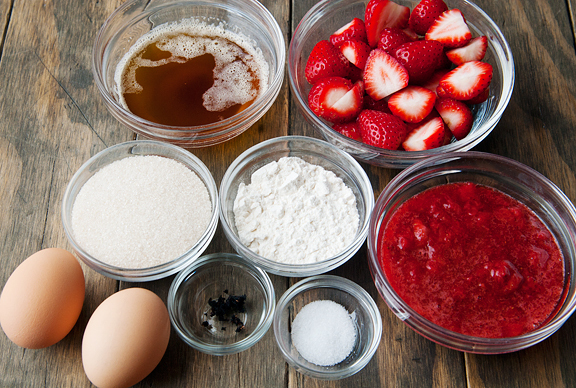 Pour the batter over the berries until the berries are just covered. 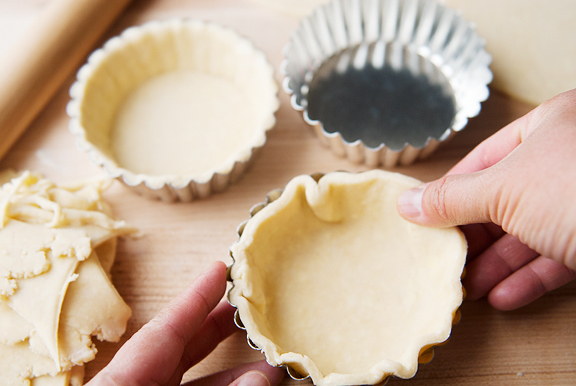 Distribute your pastry cut-outs over the tops of the tarts. Bake 25 minutes until the tops are browned. 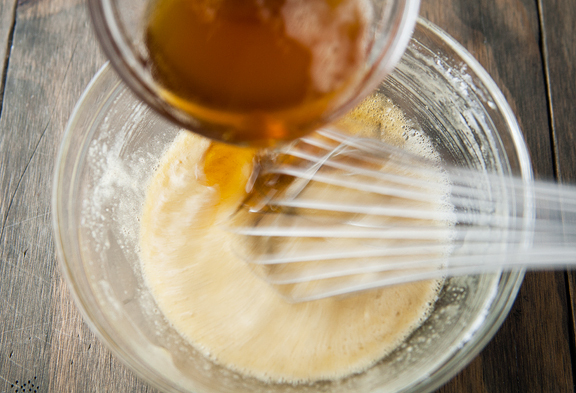 Remove from oven and let cool completely before removing from pans (you may need to loosen the edges with the tip of a sharp knife if the filling bubbled over the crust). Makes six 4-inch tarts. Should keep for up to 2 days in an airtight container. Both tarts look gorgeous and I’ll definitely devoured both, too delicious looking! Wow, that looks delicious and pretty. I am not crazy about sweets in general and can’t take a lot of them, but this attracts me. I’d love to have one right now with a cup of good coffee. These sound so good. 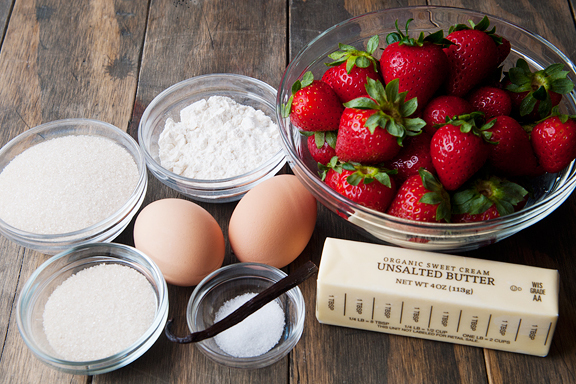 I would never have thought to combine strawberries and browned butter! 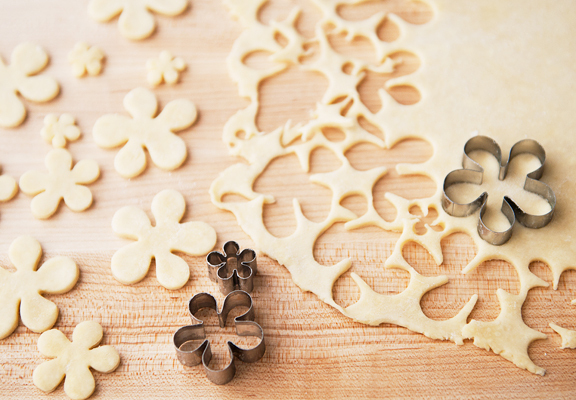 Time to make a trip to the baking store and get some tart pans & a Scooby Doo flower cookie cutter! Should I finally cave and get a madeline pan as well? These look amazing! I’m going to try my hand at them this weekend! I have a girly pool party every summer …. floating, sipping wine and indulging in yummy things. This will definitely be on the line-up! Perfectly pretty! Darn that Banjo is a cutie pie. Congratulations on logging in your 100th day on skis this season. That is quite an accomplishment. 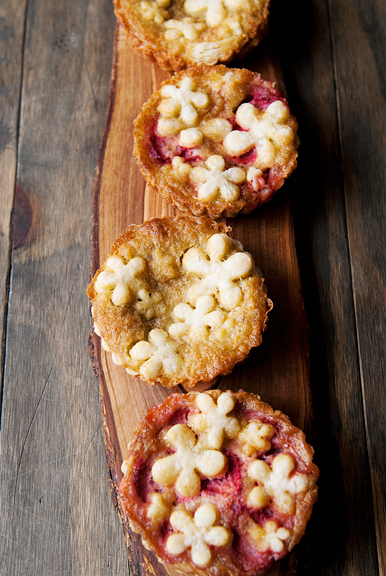 And these tarts. . .they are so cute. I love the dainty little flowers you topped them with. Yeah to Big Sur photos for inspiring you to bring this to us. Pinned for future gawking and hopefully baking. Thank you for this recipe. I can’t wait to make these for my next months book club! They’ll be a big hit for sure! More important than any of this – although very enticing – when is the puppy coming? 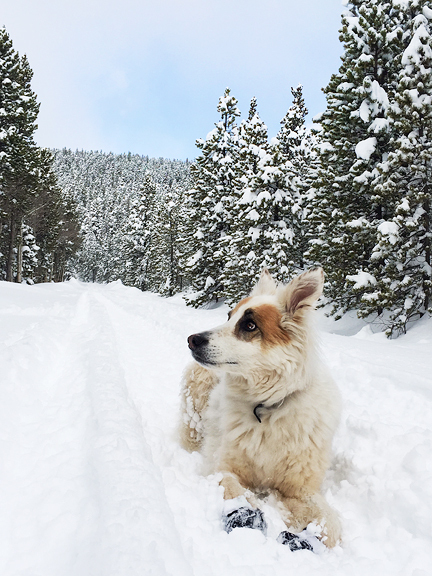 Lisa – I brought you one from Colorado. Kristin – you’ll be one ahead of me! I have not yet made the plunge for madeline pans. Jodi – I hope they worked for you! Genia – mmm, what lucky pool ladies. jill – House of Cards. Kath – you’ll know when she’s here!